'Walking Dead': So What's Gonna Happen With Negan After His Big Mid-Season Finale Moment? For the entirety of season 9 of “The Walking Dead” so far, Negan (Jeffrey Dean Morgan) has been stuck in one spot: his jail cell in Alexandria. We’ve spent some time with him occasionally, as he taunts those who visit him. This week, it’s Gabriel (Seth Gilliam) who bears the brunt of Negan’s heckling. And it’s Gabriel who seemingly made a big mistake that will change the course of Negan’s future. Late in the episode, after flustering Gabriel with his usual smack talk — Gabriel was not in the mood to deal with him because he was worried about Rosita but couldn’t see her because he was on Negan duty — Gabriel closes the cell and storms off. That night Negan discovers that the cell door is not actually locked. Then Negan walks right out of there… and that’s where his story leaves off, as we head into the mid-season hiatus. Now, Negan had a pretty key part to play in the comic book with the upcoming war with the Whisperers, those folks who we discovered were disguising themselves as zombies at the end of the mid-season finale. The TV version of “The Walking Dead” is already taking him in at least a mildly different direction, though it’s likely for the sake of condensing his story a little bit. In any case, I’m about to get into what Negan does after leaving Alexandria in the comics, which means potential spoilers ahead for the latter half of Season 9 of “The Walking Dead.” Just FYI. In the comics, Negan discovers his cell unlocked but actually doesn’t leave. He wants to stick around to try to earn Rick’s trust and show that he’s reforming. This does not work. So when a teenage boy named Brandon Rose decides to break Negan out in a bid to get revenge on both Rick, who killed his father, and the Whisperers, who killed his mother, Negan takes him up on the offer. Brandon wants to try to force the Whisperers and Alexandrians to kill each other by leaking Rick’s war plans to the Whisperers. But Negan has other ideas, and murders Brandon before heading to the Whisperer camp and pretending that he wants to join them. After a lengthy chat with Alpha, the Whisperer leader, about life as a Whisperer, Negan kills her and sneaks out of camp with her head. He takes the head back to Alexandria, and Rick allows him a measure of freedom in exchange for fighting in the rest of the war against the Whisperers, which he does. During the war, Negan accidentally breaks his bat, Lucille, in the fighting, and at one point he even saves Rick’s life. After it all ends, Negan gets his freedom for real and he goes off to live in the woods by himself. While he’s out there, he eventually is confronted by Maggie in a sequence that already played out in the show several weeks ago — when Maggie (Lauren Cohan) visited Alexandria to put Negan down for good but couldn’t bring herself to do it because he was so pathetic. 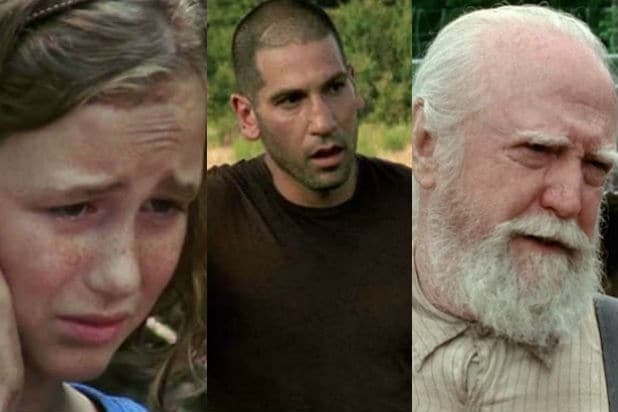 Now, the part of this story that will certainly not play out on the TV version of “The Walking Dead” is all the Brandon Rose stuff, because that character does not exist on the show. As you might have guessed from the name, Brandon is Tammy Rose’s son. But everything about Tammy Rose (Brett Butler) on the show is different — she’s married to Mr. Sutton, and their son Kenneth died in the Season 9 premiere. So with that being the case, and with Rick (Andrew Lincoln) out of the picture, showrunner Angela Kang and the show’s writers decided to, apparently, just have Negan bail when he found his cell was unlocked and skip all that other stuff. Of course, what comes next is still an unknown, as the show has demonstrated an increasing willingness to go off book the last couple years. But it’s going to be a couple months until we get to find out for sure where Negan’s story will go, now that “The Walking Dead” is on hiatus.